Home » Articles » How Much Exercise Does a Golden Retriever Need? 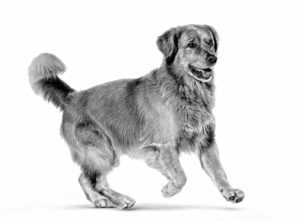 Originally bred to retrieve fallen game in the taxing and challenging terrain of the Scottish highlands, the Golden Retriever was a breed specifically created to be a sporting, energetic dog. While the vast majority of people no longer need their Golden Retriever to undertake this kind of physically demanding work, the breed still has the energy and stamina it would have needed for these tasks. That’s why it’s important that your Golden Retriever gets enough exercise – if this dog doesn’t get the exercise it needs, this can lead to both behavioural and health problems. There’s no concrete rule for every Golden Retriever, as every dog is an individual and will have slightly different needs. However, you can take a general starting point and then work up to a level that is right for your dog. For an adult Golden Retriever, you will need to exercise the dog for an hour or more each day. Look to vary the kinds of exercise as this will help to stimulate the dog’s mind as well as their body. You can try walking, running, swimming and of course playing fetch. These kinds of activities will also help to tap into the behaviours the Golden Retriever was bred for, meaning your dog will be more stimulated. It’s important to tailor the level and type of exercise to your dog. Elderly Golden Retrievers, or those with mobility or other health problems, need to be exercised carefully. Exercise is still extremely important for these dogs, as weight gain can cause further complications with their condition. How much exercise for Golden Retriever puppies? It can be difficult to know how much exercise to give Golden Retriever puppies, as they seem to have so much energy one second and then fall asleep the next. The important thing here is to give them short, structured exercise – meaning a gentle game of fetch or a brisk walk on the lead. Don’t aim for long periods of exercise, several short bursts throughout the day is far better. Also, don’t look to get the puppy doing anything too strenuous – as their bones and joints are still developing, you need to be careful not to let them do anything that might cause problems. It’s important to note that you will need to play with your puppy alongside specific periods of exercise – these less taxing play sessions will help your puppy get a little more exercise, while also helping with their development.